Paul M. Dorman High School opened its doors on August 27, 1964. Named for the visionary who had dreamed of a consolidated high school that would serve Spartanburg County's District Six communities with excellence in education and an appreciation for tradition, Dorman High School was a consolidation of Roebuck and Fairforest High Schools. Mr. Paul M. Dorman encouraged a leader in South Carolina education, Mr. Doyle Boggs of Hartsville, to assume the principal's position. He also found a successful athletic educator, Mr. Wade Corn, to assume the duties of head football coach and athletic director. Mr. Dorman selected Mr. Allen O. Clark to become assistant principal. These three educational traditionalists, World War II veterans, and former athletes helped Mr. Dorman launch a tradition of community service and excellence at the secondary level in Spartanburg School District Six. The tradition grows stronger as this school continues to serve our growing and changing district. In 1964, the newly consolidated Dorman High School had fifteen air-conditioned classrooms in two wings, offices, an air-conditioned library, a large study hall, a vocational wing, a chorus building and a band building, a cafeteria, and a gym with a seating capacity of about 2,000. The 956 students and 43 teachers who entered the new school on that day remember that Dorman's campus also had a great deal of mud and dirt from the continuing construction. The school housed the tenth, eleventh, and twelfth grades. Its Cavalier football team played on borrowed fields until the construction of J. L. Martin Stadium in 1967. Dorman High School continued to strive for athletic excellence under the enthusiastic leadership of Mr. Boggs, Mr. Clark, and Mr. Corn. In 1970, joining the state and national movement towards integration, the staff and students of Lincoln Public School, the previously segregated Black school of District Six, merged with other District Six schools. Lincoln Public School had been established in 1953 under the direction of Mr. R. P. Dawkins and served grades one through twelve. The merger of the high school grades of Lincoln with Dorman brought many years of educational experience steeped in the Black community's pride in educational excellence, providing a richer cultural experience for all students. Paul M. Dorman High School now truly served the needs of the entire district. Paul M. Dorman High School's physical plant continued to expand to meet the needs of the growing community of learners. The plan to enlarge the two original wings and connect them to each of the music buildings was completed when four classrooms were added to the main building in 1966. A second growth phase in 1969 included the addition of ten classrooms plus office, storage, and restroom facilities. Additions to Wing C were completed in 1971. New plans were already underway for additional classroom space and a new gym. In the 1977-78 school year, Dorman opened the two-story Wing D, housing the library and over fifty additional classrooms, the 3920-seat McMahan Gymnasium, and the JROTC facilities. This addition would complete the current campus. The school that started as a "farmers" school now boasts numerous advanced placement classes, 160 faculty members, national academic team winners, and state and nationally recognized students and faculty. In addition, Dorman High School has continued emphasizing technology and excellence in the fine arts and athletics. Paul M. Dorman High School has roots, which remain deep and strong in the District Six soil of tradition, patriotism, community service, and courage. However, Dorman has never been afraid to change to benefit the children of District Six, whether the change was consolidation, integration, expansion, technical improvement, or curriculum adjustment. Mr. Dorman's foundation of traditional excellence will allow "his school" to continue to serve the entire district into the next century through the construction of new facilities located at the intersection of Highway 221 and I-26. In the 2002-2003 school year, Dorman High School underwent reorganization to provide for state of the art facilities with a separate ninth grade school and a tenth through twelfth grade school. This new organization facilitates a smoother transition from the middle school to high school campus life. The freshman high school, with approximately 150,000 square feet and 34 regular classrooms, also boast seven science labs, an industrial technology education room, a JROTC classroom, a gym and weight room, an additional multipurpose room, four business labs, two art rooms, a home economics room and food lab, a band room, a chorus room, an orchestra room, media center, and cafeteria. 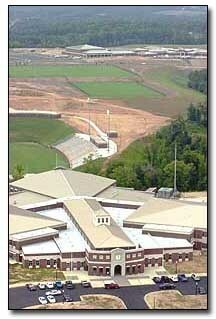 The high school, with approximately 350,000 square feet, houses 79 regular classrooms, two JROTC classrooms, fifteen science labs, four business labs, four art rooms, a drama room, a chorus room, a band room, an orchestra room, a gym with arena style seating, a practice gym, a weight room, a wrestling room, a media center, and a cafeteria. State of the art technology and security features are in place in the new Dorman High School facilities. All of these new facilities allows Paul M. Dorman High School to continue its tradition of success in academics, the arts, and athletics. Harry Gable - A Study of Dorman Senior High School for the Purpose of Determining the Adequacy of Existing Facilities, University of South Carolina, 1987. Donna Mayes - Personal Correspondence concerning Lincoln Public School, 12/17/01. Cheryl Revels - Personal Correspondence concerning the new Paul M. Dorman facilities, 12/07/01.